Edmund MARSHALL (c. 1598 – c. 1673) was Alex’s 10th great grandfather, one of 2,048 in this generation of the Miner line. Edmund Marshall was born about 1598 in England. He emigrated Hopewell in 1635. The ship Hopewell, with John Driver, master, sailed from Weymouth in Dorsetshire, England, May 8, 1635. The ship’s passenger list names 18 men, but does not list their wives, children or servants. He married Millicent BLINMAN in 1636 in Salem, Mass. He was in Salem in 1636 and then removed to Ipswich or Newbury. Edmund died about 1673. Millicent Blinman (Blieman Hallett?) was born about 1601 in England. Millicent died after 1668 in Salem, Mass. [Salisbury 352] EM in Salem in 1636 and then removed to Ipswich or Newbury. Children: Naomi, Ann, Ruth, Sarah, Edmund, and Benjamin. 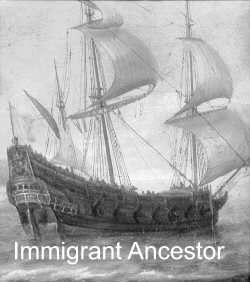 Edmund Marshall, immigrant ancestor, was born in England in 1598, according to his own deposition in 1668, and his wife Millicent was at that time aged sixty-seven. His wife was a member of the Salem church in 1637. 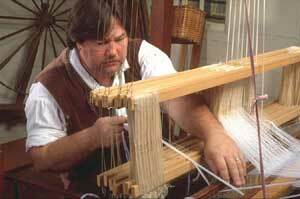 Edmund was a weaver by trade, was living at Salem as early as 1636, and was admitted a freeman May 17, 1637. He removed to Ipswich, Massachusetts, after 1646. The date of his death is unknown. Children born in Salem: 1. Naomi, baptized January 24, 1637. 2. .Ann, born April 15, 1638. 3. Ruth, born May 3, 1640. 4. Sarah, born May 29, 1642. 5. Edmund, born June 16, 1644; resided in Ipswich and Newbury. 6. Benjamin, born September 27. 1646; resided in Ipswich; married, 1677. Prudence Woodward ; children: Edmund. Ezekiel, John, and four daughters. 7. Thomas, 8. Peter. 9. Joseph, b. about 1650-1660. Children, born in Ipswich: I. Joseph, Jr., born May 18, 1690. 2. Thomas, 3. Abie/car, born September 28, 1695. Probably one or more daughters. This was probably to distinguish him from the other John Marshall then in Boston, a man from England. John’s son, John, Jr., is the one that kept the oft quoted diary in which he noted the death of his “Aunt Newcomb” in June, 1697. This is the date of death of Ruth (Marshall) Newcomb. Since John’s mother’s name was Ruth also, it is extremely unlikely he was talking of her sister being his aunt. It is pretty good evidence that Ruth Newcomb was the sister of John Marshall, and was probably also born in Scotland. Ruth’s husband John Newcomb was born July 1634 in Sudbury, Suffolk, England and was baptized 8 Aug 1634 in All Saints, Sudbury. His parents were Francis Newcomb and Rachel Brackett. John died 21 Mar 1722. in Braintree, Suffolk Co, Mass. After Ruth died, he married Elizabeth [__?__] Elizabeth died after 1720/21. ii. Samuel Newcomb b. 25 Feb 1660 in Braintree, Norfolk, Mass. ; d. 11 Dec 1707 in Braintree, Norfolk, Mass. ; m. Sarah Sheffield on 16 Jan 1689 in Braintree, Norfolk, Mass. iii. Ruth Newcomb b. 1663 in Braintree, Norfolk, Mass. ; d. May 1742 in Braintree, Norfolk, Mass.and was buried 26 May 1742 in Braintree, Norfolk, Mass. ; m. John Copeland on 1682 in Braintree, Norfolk, Mass. v. Rachel Newcomb bapt. 13 Oct 1672 in Braintree, Norfolk, Mass. ; d. 16 Oct 1750 in Stoughton, Norfolk, Mass. ; m. John Fenno on 25 Jun 1690 in Milton, Norfolk, Mass. vi. Hannah Newcomb bapt. 13 Oct 1672 in Braintree, Norfolk, Mass. ; m1. William Hayward on 22 Nov 1693 in Braintree, Norfolk, Mass. ; m2. William Thayer on 22 Sep 1699 in Braintree, Norfolk, Mass. vii. Bethia Newcomb b. 14 Jan 1674 in Braintree, Norfolk, Mass. ; m. John Kingman on 1 Dec 1698 in Bridgewater, Plymouth, Mass. Edmund’s wife Martha Huggins was born 11 Nov 1654, Hampton, NH. Her parents were John Huggins and Bridget Green. Martha died 27 Aug 1697, Suffield, Ct.
After Martha died, Edmund married Lydia Pierce of Enfield m. int. 7 Jun 1700, Suffield CT. She is the widow of John Pierce and probably the daughter of Miles Morgan and Prudence Gilbert.. Widow Lydia Marshall d. 30 Jul 1737 Enfield, CT.
i. Edmund Marshall, b. 15 Oct 1677, Newbury, MA; d. 30 Dec 1695, Suffield, Ct.
ii. Mary Marshall, b. ca. 1679, prob. Newbury, MA; d. 15 Aug 1751, Suffield, Ct; m. 24 Oct 1717, Suffield, CT to Thomas Copley. iii. John Marshall, b. 1682; d. 9 Apr 1756, Suffield, Ct; m. 16 May 1723, Suffield, CT to Sarah Miller. iv. Martha Marshall, b. 6 Nov 1685, Suffield, Ct.
v. Elizabeth Marshall, b. 17 Mar 1688/89, Suffield, Ct; d. bef 11 Sep 1733, Suffield, Ct; m. 7 Jul 1715, Suffield, Ct to James Rising. vii. Abigail Marshall, b. 21 Aug 1697, Suffield, Ct; m. Ephraim Trumble. In November 1668, Benjamin Marshall and his brother-in-law [our ancestor] Thomas WELLS were arrested for “reproaching the court.” See Thomas WELLS’ page for details, though here is an excerpt about the Marshall family problems. Warrant, dated Nov. 16, 1668, to Benjamin Marshall, for high misdemeanors, also to witnesses, Stephen Crosse, John Bayer, and Robert Crosse, jr., signed by Samuel Symonds. * Bond of Benjamin Marshall, Richard Brabrooke, surety. Edmund Marshall, aged about seventy years, and his wife Melesent, aged sixty-seven years, deposed “As for my son Benjamin we never knew him given to Mallice or Revenge in all our Hues: nor to speak reproachfully of Magistrates or of any other: and as for Goodman Crosse we haue lived by him many years and neuer hard him spake ill of authority or against any Magistrate, but as for our Daughter Naomi we do think in our very hearts that certainly in her heart she hates her Brothers both Edmund and Benjamin though we spake it with greif of heart, for she would off en revile Benjamin and call him Rogue before our faces when we could never find what grounds she had so to do or hard any cause he had giuen her in words or actions; and when we reproved her for it, she would face us down it was false giving us the lye as it were to our faces, where upon I told her that I had been in y* church of Salem 30 years and upward and never was so detected as your father and I am by you our one child, where upon she replied again to us saying we might tell a hundred lies for all that and nare be known, for she could do it, and being long sick and in y* opinion of most y* came to visit me Judged I should neuer recover, yet she could say in a reviling way that I did desemble, and further we atest that Thomas Wells did say in a threatening way that there was something aworking that would tak affect not long after we heard of his accusing of our son Benjamin to goodman Brag for threatening his house should be burned and his Complaint of him concerning our honored Major, which is matter of great grief to us now in our old age, whether it be not out of a spirit of maliciousness that Thomas Wells should do thus, we have cause to think no other, by reason of his words to his brother Edmund at my house one Sabbath day: for coming in we ask him to eat with us, but Thomas Wells answered no for if I cant have your good will except I be a servant to y* Devil I care not: to the which his mother replied and asked him whether he knew what he said: and he answered yea; because you persuaded me to be at peace with him whom I can haue no peace with pointing to his brother Edmund; we asked why he said so, he said he had committed no sin in so doing; this we are forced to speak with grief of heart our conscious puts us upon it, further when he drew our daughter Sarah away from helping of me when I was in distress and lame, for we said to him that he would undo her but he said trouble not yourselves I will provide for her, so that she is gone from us and left us desolate of help: and now can call her Brothers Edmund and Benjamin Roges at will.” Sworn Nov. 19, 1668, before Samuel Symonds. Benjamin signed the petition in support of John Proctor oldest son of our ancestor John PROCTOR and his wife Elizabeth Proctor at the Salem Witch trials. ii. Prudence Marshall b. 24 JUN 1679 in Ipswich, Essex, Mass. viii. Susanna Marshall b. 2 DEC 1693 in Ipswich, Essex, Mass. ix. Rachel Marshall b. 28 DEC 1695 in Ipswich, Essex, Mass. This entry was posted in 12th Generation, Immigrant - England, Line - Miner, Witch Trials and tagged Salem, The Hopewell 1635, Wells/Marshall Feud. Bookmark the permalink. Coat of Arms removed. In reality, Edmund Marshall was not part of the gentry and did not have a coat of arms.